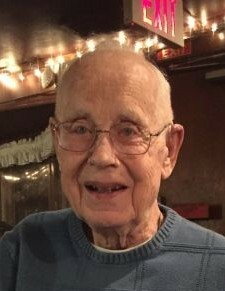 Frank W. West, 91, of Kansas City, passed away on March 28, 2019. The third youngest of seven children, Frank was born on January 9, 1928 in Kansas City, MO to Frank Sr. and Erma (Henry) West. He graduated from Central High School and was drafted into the Army in 1949. during the last two years of WWII he spent time rebuilding the communication lines in Japan. After his release from the Army, he met and married his wife of 66 years, Alta. He began working for TWA and retired from the company as a maintenance manager. He enjoyed spending time with his family, refinishing furniture, and loved to eat anything and everything. He is preceded in death by his parents and wife and is survived by his two daughters, Gayle Rowe and Gaye Christian; grandchildren, Andrew Rowe, Jason Rowe, Parker Christian, Sydney Christian, and Emily Scott; five great grandchildren and numerous nieces, nephews, cousins, and friends. A celebration of life will be held on Monday, April 1st at 2:00pm, with visitation one hour prior, at Terrace Park Funeral Home and Cemetery - Lakeside Chapel.